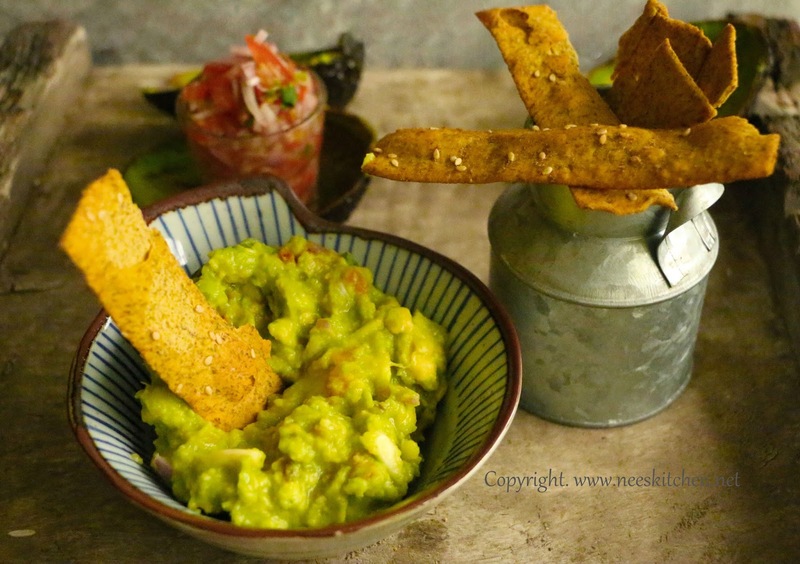 Guacamole is a dip originated from Mexico and later it has been used in American cusine as a dip. This post is about “Crunchy Guacamole” with ingredients available in an Indian kitchen. 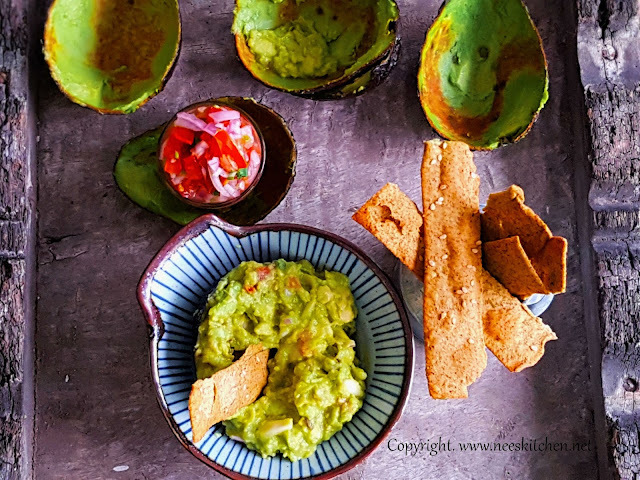 Guacamole is made out of Avocado, lime juice, garlic, cilantro , jalapeno are combined and ground with tomato & onion and served as a dip to any healthy chips. 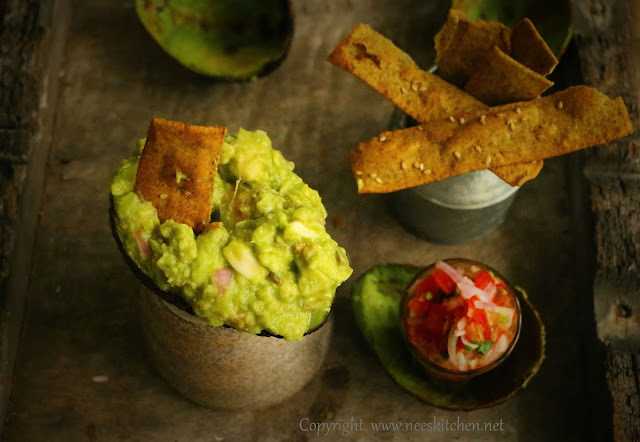 Crunchy Guacamole is made out of Avocado, lime juice, garlic, cilantro , jalapeno and Pico de gallo sauce. 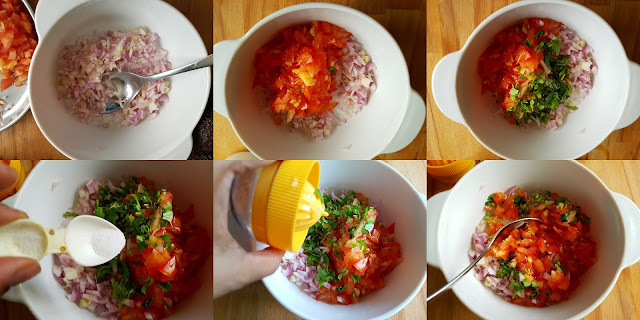 Pico de gallo sauce is made out of cherry tomatoes, white onion , cilantro and chili’s. Well most of them are quite difficult to get if you go to an Indian market and many of us land up consuming this recipe in a restaurant or buy a store bought one. 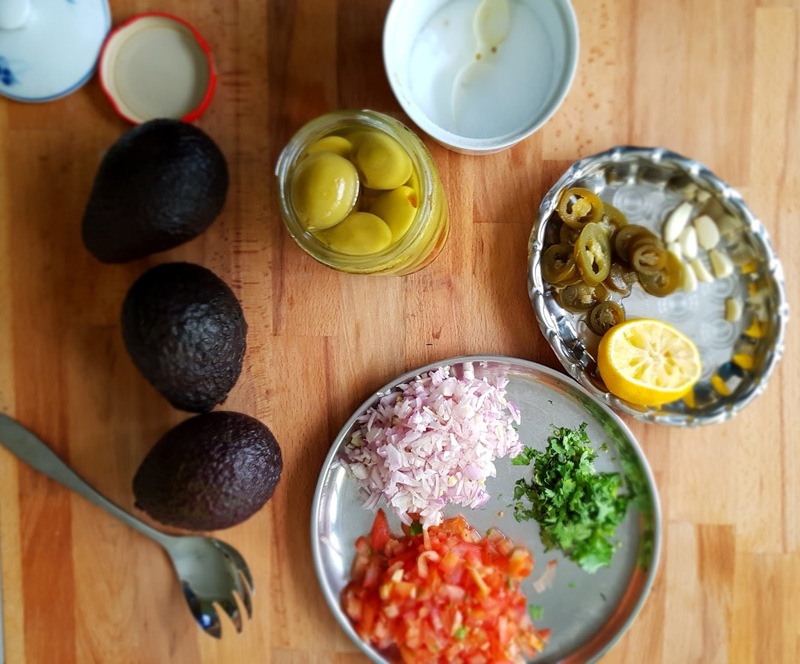 Though all these ingredients are available easily for me in Singapore, I decided to go to Little India market and purchase the ingredients needed for this recipe. This would give me an idea what is available and not available in a typical Indian vegetable market (not super markets) and finally I can arrive at an Indian version of this recipe. To my surprise, I got only garlic and lemon!!! So I replaced white onions with red. Jalapeno with green chili, cilantro with coriander leaves and cherry tomatoes with ripened big tomato. Avocado is a must hence I got them from Fairprice supermarket. It is a must to use a mortar and pestle for this recipe as it must be crunchy. Hence do not use the blender. Make sure the onion and tomato are finely chopped as they have to be marinated. Do not grind them. So with these ingredients I wanted to go with DIP Foods -“Baked Multigrain Strips – Moong” which is made out of gram flour, whole wheat flour, yogurt, coriander, salt & ginger. The amount of oil used is very less and I cannot feel any oiliness. The packet was airtight and was very crispy when we opened it. 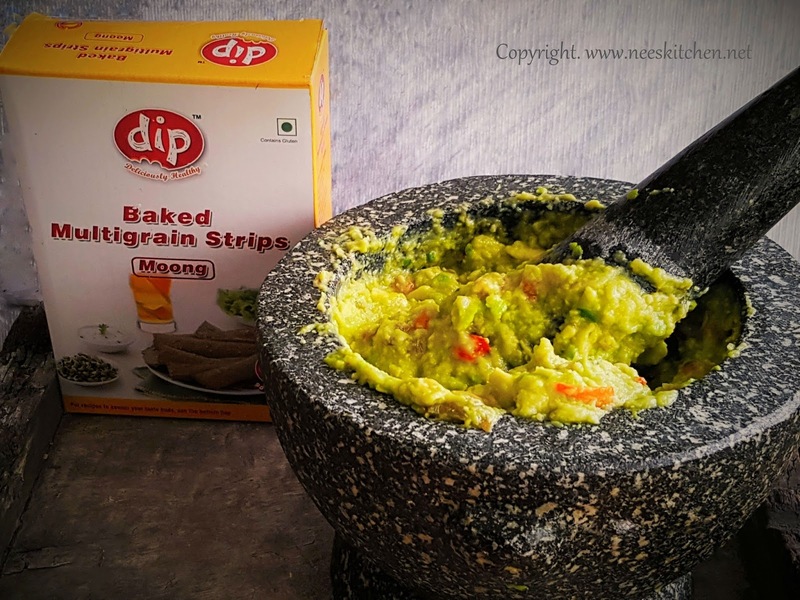 This is my 5th recipe with DIP Foods and every time I open there product I have only 3 immediate comments to give which is absolutely no oil, fresh & very crispy. They all taste so good and they make a perfect healthy tea time snack. 1. Prepare the tomato onion sauce mix. 3. Take a bowl and add finely chopped tomato,onion,chili, lemon juice and coriander leaves. 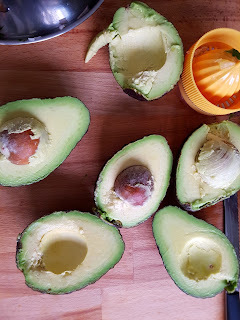 Add lemon juice and salt. Mix them well. Let this marinate for 20 minutes. 4. 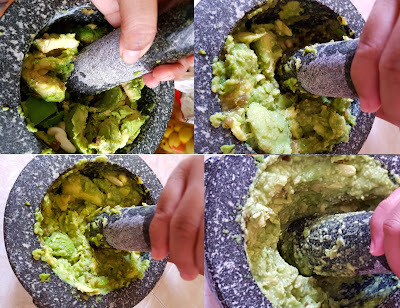 For the chunky guacamole, peel avocado, garlic. Chop them roughly. Chop coriander leaves, jalapeno roughly. 5. Take a mortar and add avocado,garlic, coriander leaves, jalpeno, lemon juice & salt. 6. Grind them until they turn completely mushy. Garlic must be crushed well. 7. At this stage, add the tomato onion sauce mix and grind again. 8. This cannot be like a paste and shall be crunchy. It is a must to use mortar and do not use mixie.